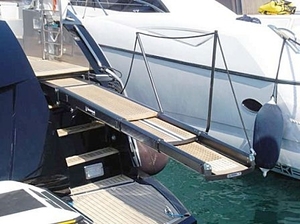 A telescopic gangway takes the form of a board connecting a boat and a dock. There are many different designs and sizes. The wide variety offered by NauticExpo includes built-in and rotating models. The gangway's primary function is to link vessel and dock for embarking and disembarking. A gangway also can be a structural element connecting one dock to another. Telescopic gangways are characterized by multiple segments that slide into and out of one another, usually powered by small electric motors. Configuration, design and constituent materials vary from one model to another, though most are of wood or metal. The main elements to consider are the vessel's type and size. Telescopic gangways save deck space.